The Career Center is your connection to the professional world. Your creative career starts long before you graduate. That’s why we encourage you to take advantage of our Career Center: a one-stop shop that helps you navigate the path from college to career. From your first day on campus to graduation and beyond, we work with you to increase your employability and help you find meaningful work and internship opportunities. The Career Center offers an ever-expanding range of services to help you earn income while you’re in school and gain hands-on experience in creative industries. Identify potential career paths and goals. Improve your resume, cover letter, and interviewing skills. Land a relevant internship or job. Develop your visual brand, including logos, business cards, and more. The Career Center hosts events and workshops on and off campus. Learn how to work as a freelancer. Develop your job search and interviewing skills. Network with creative professionals from top companies. 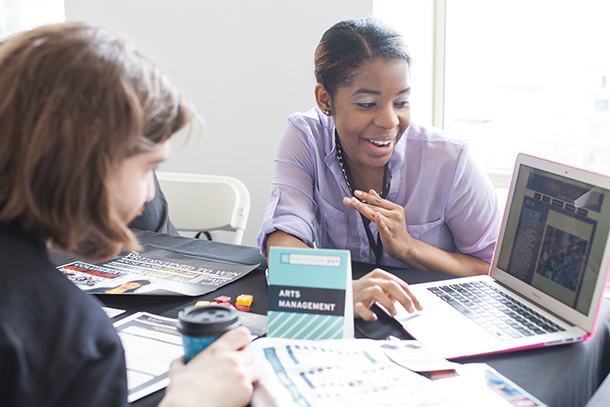 Get your portfolio reviewed by industry partners. Search for internships, on- and off-campus jobs, and full-time career opportunities. Register for our events and workshops. View sample resumes, cover letters, and other professional-development resources. Schedule appointments with Career Center staff and continue those discussions online.